Give your baby a safe place to have tummy time, sit or learn to crawl. 3 ft x 3 ft with fences up or 4 ft x 4ft when flat to give you a safe tummy time mat or baby ball pit. Play mats for infants are a great place to learn to sit or crawl. 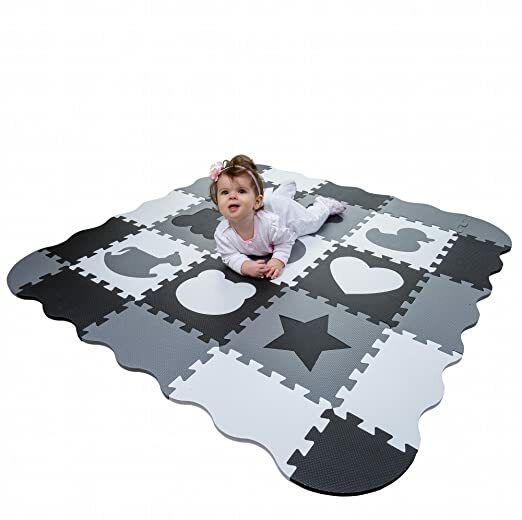 Play mat is greater than 1/2 inch thickness for that extra protection from bumps and toddler falls. Provides cushioning for wood and tile floors and keeps baby off dust and dirt of carpet. The COLLAPSIBLE edges can be used to keep in toys and balls. They will NOT keep a rambunctious crawler in. You can feel good about our hypoallergenic foam play mat that has been 3rd party tested in the US to meet CPSIA standards. They are FREE of BPA, Phthalates, Lead, Formamide and Latex to keep infants and kids safe. Use under your favorite infant activity gym for a soft and safe base or for the floor of a baby play yard. We have designed these interlocking foam mats specifically to be safe for all ages. No small puzzle pieces are present for your child to choke on. Safe to use as a baby activity mat or a baby crawling mat. Babies will have a soft place to land and the foam floor tiles keep them safe from the hardness of floors or dirt and dust of carpets. Toddlers have a soft place for playing or reading. design allows you to lay it flat for larger area or put borders up for a soft fenced area. Neutral black white and gray colors are a stylish addition for any playroom or nursery. INCLUDES zippered portable carrying case for easy storage. ENCOURAGES DEVELOPMENT of fine and gross motor skills, hand eye coordination, reasoning and visual sensory development. Use for tummy time, learning to crawl or play. The contrasting color design is easy for babies to see and is also stimulating to young infants.